A number of places with Church in the name can be found in the New Forest, all a considerable distance away from today's villages - there are a number of Church Places, a Church Moor (A) in Mark Ash Wood and another (B) near Burley, and a Church Green (C). But these are not the sites of churches, for the names were simply assigned to unexplained earthworks by New Forest folk who followed the now discredited belief that William the Conqueror destroyed whole villages, including churches, to make space for his favourite pastime: hunting. At least three – The Churchyard, Sloden (D); Church Place, Denny (E); and Church Place, Ashurst (F) - are actually the sites of hunting lodges dating from the 13th to the 15th centuries. Studley Castle (G) - again, a misnomer - near Bramshaw Telegraph, was another hunting lodge, a fifth lodge was close to Queen Bower (H), Brockenhurst; and a sixth was at Bolderwood (I). Earthwork remains can still be seen, and apart from the last, the location of each is shown on modern maps. Other lodges, too, existed, including one within the bounds of Lyndhurst Old Park (J), but these have yet to be located, probably because at least some have been destroyed by later forestry operations. Many of the lodges were relatively modest dwellings. Often constructed of timber frame with plaster infill and slate roof, each was surrounded by earthworks or palisades to provide protection from thieves and other undesirables. The cost of building the lodge at Bolderwood, though, was almost three times as much as that elsewhere, and this is where the King stayed. 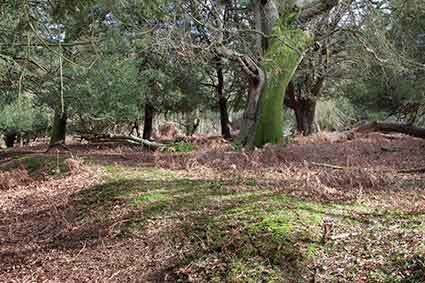 It has been suggested that the others were simply used to house New Forest officials.